The Global Resource Information Database (GRID) is a worldwide network of 15 environmental data centres managed by the Division of Early Warning and Assessment (DEWA) of the United Nations Environment Program (UNEP). Based in Geneva’s International Environment House, GRID-Europe has a scientific and administrative partnership with University of Geneva (UNIGE). GRID-Europe specialised in handling and analysing spatial and statistical data on environmental and natural resource issues through computerised Geographic Information Systems (GIS) and remotely-sensed imagery. Over the years, GRID-Europe has compiled an archive of global and European geospatial and tabular databases, and makes them accessible to the global community through Internet-based applications. - Lake Balaton Integrated Vulnerability Assessment, Early Warning and Adaptation Strategies project1. - IMOS: Evolution of the Mesopotamian marshlands ecosystem. - FP6 METAFUNCTIONS project, is pooling expertise in bioinformatics, computer science, geographical information systems and marine sciences to develop a data-mining system that correlates genetic patterns in genomes with contextual environmental data. - The GEO Data Portal, the authoritative source for data sets used by UNEP and its partners in the Global Environment Outlook (GEO) report. - FP7 ACQWA project data warehouse and spatial direct interface. Dr. Anthony Lehmann was trained as an aquatic biologist who specialized in GIS and statistical analyses. He is the Project Coordinator (see link in the UNIGE article above for more details). Ron Witt is the Director of UNEP/GRID-Europe and will coordinate the project with UNEP activities in this field and region. Dr. Nicolas Ray is a biologist specialized in GIS and spatially-explicit modelling. He is the Project Manager (see link in the UNIGE article above for more details). He will contribute to all tasks related to grid infrastructure support and gridification of applications. Gregory Giuliani After obtaining a degree in Earth Sciences, he went on to complete a master in Environmental Sciences, specializing in remote sensing and GIS. He previously worked as a GIS Consultant for the World Health Organization, as a University tutor in remote sensing and GIS and as a GIS Developper in a local Swiss GIS company. He works at UNEP/GRID-Europe since 2001 and is the focal point for Spatial Data Infrastructure (SDI). In 2008, he also started to collaborate closely with the enviroSPACE laboratory where he begins a Ph.D thesis and works also for the FP7 ACQWA project. In enviroGrids, he is involved as WP2 leader where his objective is to coordinate SDI and Grid technology researches. Personal page: http://www.unige.ch/climate/Team/Giuliani.html is a geologist and environment scientist who specialized in GIS analyses and Internet map server. He will be Work package leader of WP2 on SDI. Dr. Hy Dao is a geographer who will coordinate the task on demographic scenarios. Dr. Andrea de Bono is a geologist specialized in GIS analyses who will contribute to the demographic and climatic scenarios. Karin Allenbach is a geologist specialized in remote sensing who will contribute to task on this topic. The enviroSPACE group is dedicated to spatial analyses within the Institute for Environmental Sciences, under both the Climatic Change and Climate Impacts group and the Forel Institute. The laboratory aims at promoting interdisciplinary research based on spatially explicit information and indicators on the present and future state of our changing and complex environment. Dr. Anthony Lehmann Dr. Anthony Lehmann is the EnviroGRIDS project initiator and coordinator. He holds a Masters Degree and a PhD in Aquatic Biology from the University of Geneva, and a Postgraduate Master in Statistics from the University of Neuchâtel. He specialized during his career in combining GIS analyses with statistical models. At the University of Geneva he is in charge of the enviroSPACE laboratory exploring Spatial Predictions and Analyses in Complex Environments. He is sharing is working time at a 50% rate with the United Nations Environment Programme (UNEP) Global Resource Information Database (GRID) under a special agreement between the University of Geneva and UNEP. At GRID, Dr. Lehmann is responsible for organizing research activities by leading the “environmental monitoring and modelling” unit. With the EnviroGRIDS project, his personal objective is to motivate all the partners to give their best in order to create a great observation system for the Black Sea Catchment. He will be specially involved in WP3 and WP5. Personal page : http://www.unige.ch/climate/Team/Lehmann.html will insure the project coordination and the liaison with the GRID team. Dr. Nicolas Ray Dr. Nicolas Ray is the enviroGRIDS project manager. He holds a Master in Environmental Sciences, a PhD in Biology from University of Geneva in the field of Human Population Genetics, and a postgraduate certificate in Computer Sciences. Nicolas’ research activities focused on the modeling of animal movement and habitat, with the development of several spatial and statistical analysis tools to integrate various data types (genetic, environmental, demographic). Through his research and various consultancy works, Nicolas acquired solid competencies in GIS, spatial analysis, software development, and grid computing integration. After six years of postdoctoral research in Australia, UK and University of Bern, he recently joined the Institute of Environmental Science at University of Geneva and UNEP/GRID-Europe to dedicate his time to the enviroGRIDS project. In addition to managing the daily activities of the project and ensuring high quality deliverables, he will take an active part in WP2 with all tasks related to the integration of grid computing and SDI. Personal webpage : http://www.unige.ch/climate/Team/Ray.html will ensure the project management and the liaison with administrative bodies at University of Geneva. Dr. Douglas Cripe (M.Sc. in Atmospheric Science and Ph.D. in Physical Geography) is a Project Officer within the Group on Earth Observation Secretariat, working primarily on the administration of Tasks in the Water and Agriculture Societal Benefit Areas (SBAs), as well as the Data and Architecture Transverse Area.. He also occupies a position as senior scientists at the University within the C3i group. UNIGE is coordinating the EnviroGRIDS project and leading WP1 and WP2. UNIGE is involved in many tasks and deliverables across the project in order to keep the best possible overview on the entire project. Its main tasks are however linked to the management of the project (WP1), the development of the grid-enabled spatial data infrastructure (WP2), remote sensing data integration (WP2), scenarios of demographic and climate change over the Black Sea Catchment (WP3), sustainability and vulnerability assessment of the BSC (WP5), and finally development of the after-life plan for EnviroGRIDS (WP7). The company Arx iT SA is a Swiss and French market leader in the Geographical Information Systems (GIS) domain. Arx iT’s core business consists in technologies consulting and GIS integration solutions combined with quality assurance practices. Arx iT is actually focused in customized applications which tend to make easier the edition, the treatment, the use and the diffusion of GIS data. Therefore, Arx iT opted for a team of co-workers and partners specialized in environment, mobility and transportation matters. Through its various projects, Arx iT has always adopted a quality-focused process. The company has therefore naturally set up a quality control system and it has also recently obtained the ISO 9001-2000 certification. David BeniDavid is CEO of arx iT Consulting, company involved in WP2, especially around the 2.2 and 2.7 tasks (GRID enabled SDI architecture, storage and exchange of data and metadata, interoperability). David is graduated in Software Engineering from the Swiss Federal Institute of Technology in Lausanne (EPFL). During is education, he rapidly moved towards Geographical Information Systems (GIS) issues. In 2001, he set up arx iT Consulting, which is mainly active in technologies consulting and GIS solutions integration. David is mainly focused on the analysis and the conception of information systems and to project management. Related to this project, the expertise of Arx iT will be useful especially for software development associated to the Spatial Direct Server architecture (WP2). The GIS expertise combined with our know-how on data treatment and processing will be helpful in the project’s success. Melitopol State Pedagogical University was founded in 1923. The University has 7 Faculties, 19 specialties. There are more as 5.000 students. Scientific Department of University represent from 300 scientists, specialists, engineers and administration. The department involved within the framework of the project is Azov-Black Sea Ornithological Station (AZBOS). AZBOS was born on the 12th December 1985. It is an interdepartmental subunit of two institutions: 1- Schmalhausen Institute of Zoology (National Academy of Sciences of Ukraine) and 2- Melitopol Pedagogical University (Ministry of Education and Science of Ukraine). Principal direction of the Station’s scientific investigations: Control of ornithofauna, estimation of ornithological situation in the south of Ukraine and current changes in bird distribution and number; Investigation of wetlands in the region, having international importance and development of recommendation on their conservation; Study of bird migratory routes, their structure and stability to conserve bird species, migrating in Eurasia; Biological monitoring of rare and threatened bird species of Ukrainian steppe zone, finding of their nesting grounds; Inventory of natural reserve areas. In 2000 due to the initiative and financial support of WWF Odessa Project Office there was created Wetland Management Unit (WMU) as department of Azov-Black Ornithological Station. WMU has wide network of experts in ornithology, herpetology, terriology, geobotany, floristics, ichthyology, hydrobiology and landscape diversity. The Unit is a centre of technical expertise and international cooperation to conserve and sustainable use of wetlands and their resources. Its activity is directed at: Preparing management-plan and propositions to support biodiversity in coastal and aquatorial ecosystems; Carrying out monitoring; Gathering and analysis of data on use of wetlands and their resources; Implementing of trainings, technical consultations and expert estimation on problems of wetland management and support of their biological diversity. TACIS project “Emergency Planning and Flood Protection in the Lower Danube EuroRegion” (2005 - 2006) (some experts). 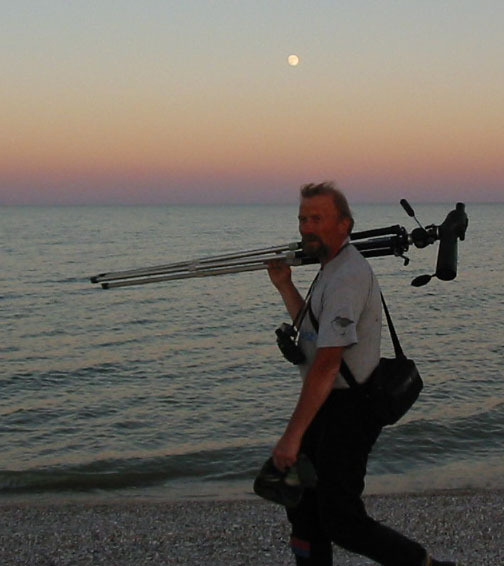 Josef ChernichkoPresent position: Head of the Azov-Black Sea Ornithological Station. Director of Wetlands and Protected Areas Management Unit. Scientific interests are evolutionary and population avian ecology, migrations. Over 40 years of scientific studies in the field of ornithology and ecology. Participant and organizer of several international expeditions. Coordinator of waterbird monitoring in 7 Black Sea countries within the programme of Wetlands-International-AEME. Author and programme leader of the Regional Ornithological Monitoring. Project leader of more than 20 scientific and scientific-practical projects including those in the framework of the activity of such organizations as Wetlands International, WWF, GEF; worked as an expert in TACIS projects. Dr. Chernichko leads the Wetlands and Protected Areas Management Unit (WMU), which activity is focused at development recommendations for wetlands management. Under his guidance WMU executed over 10 elaborations for management of Danube delta areas. The most large-scale of them is ‘a Vision for the Danube Delta, Ukraine’ (in collaboration with WWF Danube-Carpathian Programme and Stroming Bureau, the Netherlands). Dr. Chernichko is a co-author of this voluminous document, as well as co-author of 5 other monographs and about 150 scientific papers. 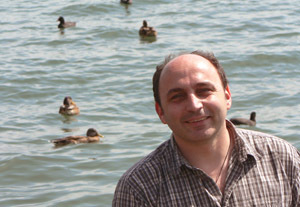 Since 1993 he is a member of National Committee on rare bird species at the Ministry of Ecology and Natural Resources and Corresponding member of Ukrainian Ecological Academy of Science and also of such organizations as: Menzbir Ornithological Society (Russia); Ornithological Committee of North Eurasia; International Wader Study Group (WSG). Current activity in EnviroGRIDS project is focused at the assessment of influence of climate and landscape changes, and demographic scenarios on biodiversity and ecosystems. , Candidate of Biological Sciences, ornithologist, ecologist – team leader. AZBOS is taking part in two tasks and several deliverables on “Biodiversity” and “Ecosystems” so called societal benefit areas within WP5. CCSS is an association of high tech SMEs, the public administration and research organisations. It is an independent, non-profit and non-governmental organisation. CCSS is a type of virtual centre of excellence with the focus on the implementation of new communication and navigation technologies which have potential for sustainable development. The CCSS co-operates with a wide range of institutions and individuals, home and foreign ones. International activities in the field of international projects, utilisation of modernist technologies, co-operation networks of the small and medium business within the framework of regional economies comprise intensive contacts, particularly in Europe, Africa and South America. CCSS is national coordination office for the United Nations Spatial Data Infrastructure (UNSDI) initiative. The objective of UNSDI is to enhance spatial data and information sharing between UN agencies and programmes, as well as national and regional SDI’s, and promote and achieve sustainable development through a.o. opensource software solutions. A BARD Analysing Broadband Access for Rural Development (A-BARD) is the Coordination Action (2005 – 2006) to research rural broadband provision and use, as part of the Scientific Support to Policies in the EU Sixth Framework Programme. WINSOC. The key idea of WINSOC is the development of a totally innovative design methodology, where the high accuracy and reliability of the whole network is achieved by introducing a suitable coupling among adjacent, low cost, sensors that gives rise to a distributed detection or estimation more accurate than that of each single sensor, without the need for sending all the data to a fusion centre. Dr CHARVÁT Karel. Education: Charles University in Prague - Doctor in theoretical cybernetics. Dr BOUKALOVÁ Zuzana. Education: Charles University in Prague – Faculty of Science, Department of Hydrogeology and civil engineering, RNDr (doctor in environmental science). CCSS is leading the task on sensor data integration in WP2 and taking part in the interoperability task. In WP6, CCSS will build a Uniform Resource Management (URM) platform that will be integrated within BSC-OS Portal and EnviroGRIDS Platform in order to support effective exchange of knowledge and information.